The SFCC community is invited to experience this new resource on campus; Science on a Sphere (SOS) in Room 803. 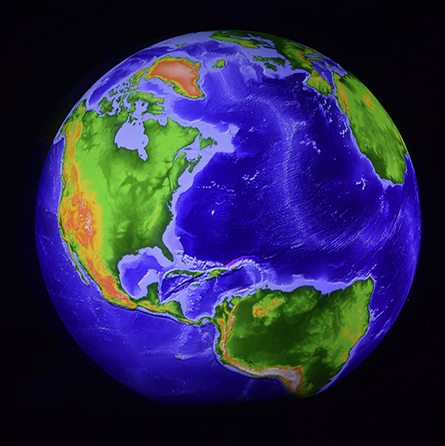 SOS is a 6-foot-diameter sphere that displays images of planet Earth and its various systems (water, land, air, human impact). The images are beautifully presented and they invite viewers to both learn and step back in awe of the beauty and complexity of our Earth. GLOBAL WARMING has become GLOBAL WEIRDING (Climate Change). On Wednesday February 20 at 4:00pm and 5:00pm …. and…. 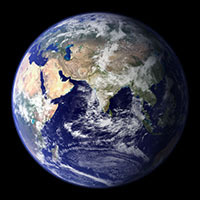 Wednesday, February 27 at 4:00 pm and 5:00pm, a 30 minute presentation on Global Warming and Climate Change will be given at the Science on a Sphere (SOS) Center, Room 803 at the Santa Fe Community College. Presenting will be Dr. Edwin Barker, retired NASA scientist and Chair of the SOS Advisory Committee, and Rev. Dr. Dave Wasserman, honorably retired Presbyterian Church and author of Riding the Blue Marble (2018). The presentation will review the basic concepts of weather, climate, earth’s natural balancing systems, the impact of CO2’s heat-trapping blanket, and how to look for the silver buckshot of hope.